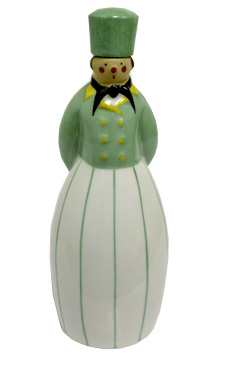 One French art deco porcelain liquor bottle by Robj, France. This Robj flacon a’liqueur titled “Curacao” (Green) and documented as # 243 in Vanna Brega’s book “Robj Paris: Le Ceramiche 1921-1931” published by Leonardo Periodici. Ca. 1930. Measuring 10 ¼” high.